After every home game of Penn’s 1959 football season, Alex Newmark W’63 had the same ritual. Along with several hundred of his classmates, he rushed from the stands onto Franklin Field and waited near the end zone as other students climbed onto the goalposts, swayed them, and eventually brought them down. That tradition of tearing down goalposts remained at Penn until the 1980s when students famously threw them into the Schuylkill River after Ivy League championships. But back then it was different because, according to Newmark, students tore them down after every win. Also, the goalposts were still made of wood, so shards would inevitably come off — and Newmark made sure to collect at least one piece from every game. Newmark, then a freshman who went to football games simply because “it was pretty much what everyone did,” may not have known it at the time but he was picking up pieces of history. Penn captured its first Ivy League championship that season, a feat they would not accomplish for another 23 years. 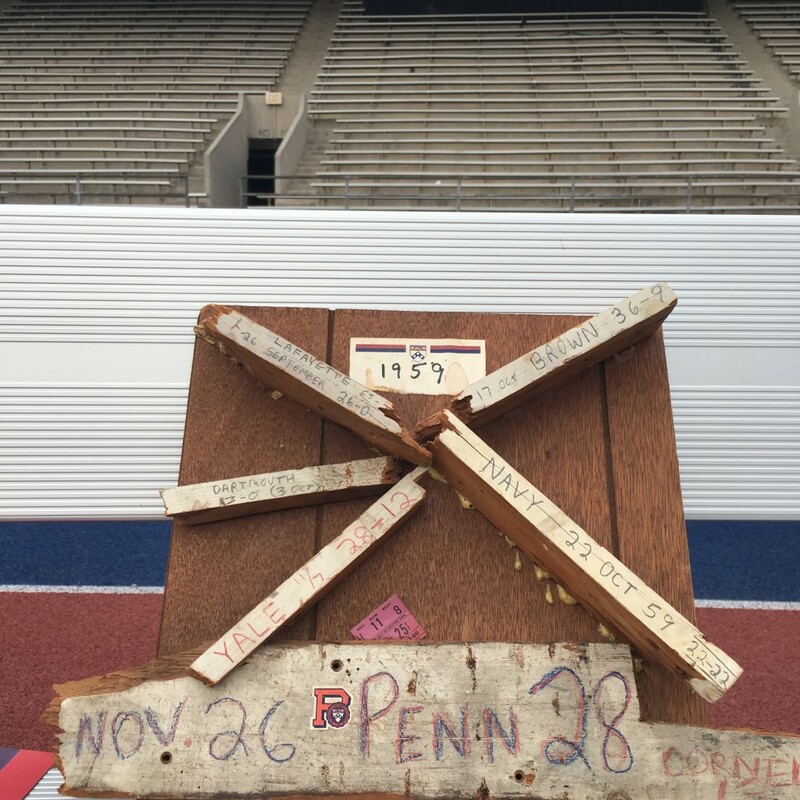 And Newmark commemorated the achievement by mounting a piece of every goalpost to one very cool slice of memorabilia — which, after more than 50 years of ownership, he’s decided to gift to Penn Athletics. “They traveled with me everywhere,” said Newmark, who’s now retired from a career in employee relations and living in south-central Virginia. “And I just thought as part of my estate planning, I don’t want to leave them to get thrown out or have my son deal with it. I can picture them in my mind. “The other things I stole from Penn, I’ll leave for him to decide what to do with,” he added with a laugh. A loyal alumni magazine reader, Newmark first mailed his piece of artwork, with each goalpost labeled with the final score and date of the game, to the Gazette office. 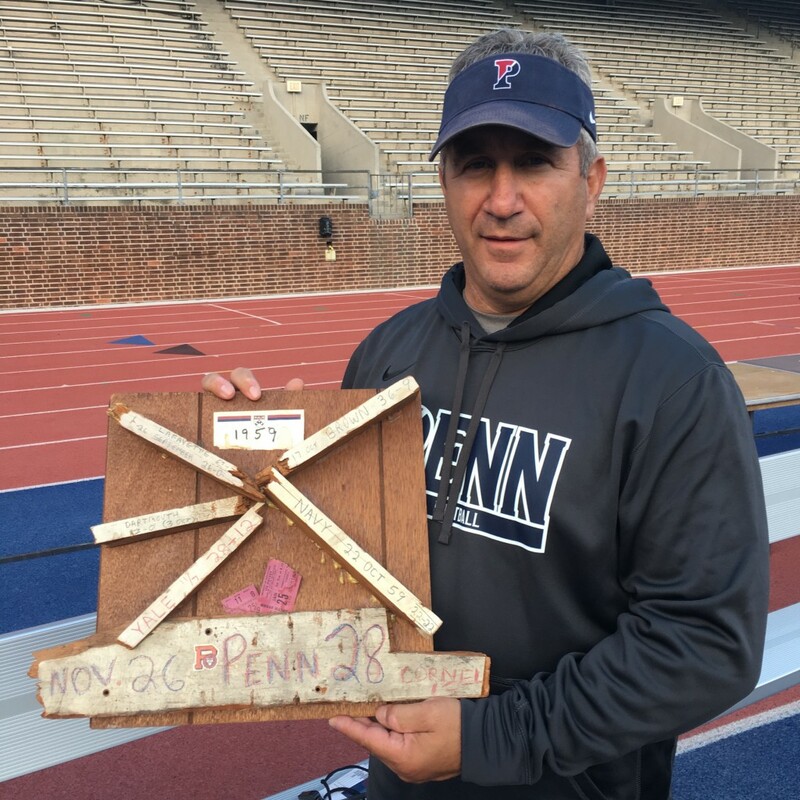 I then took it to back to its rightful home at Franklin Field this week to show head coach Ray Priore, who enjoyed seeing a piece of history and seemed eager to display it in the Penn football office. While Penn went on to win 16 more conference championships, that 1959 may have been the most interesting one. The Quakers, a national powerhouse in the 1940s, saw a sharp decline in their football success leading up to the formation of the Ivy League in 1956, going winless in the 1954 and 1955 seasons and sputtering through three more losing seasons in ’56, ’57 and ’58. Then after beating Cornell to win the 1959 crown — Newmark recalls star receiver Barney Berlinger Jr. ME’60 catching a ball over his shoulder “Willie Mays-style” to seal the 28-13 victory over the Big Red on Nov. 26 — head coach Steve Sebo was promptly fired, a decision the administration likely made before the season even began. From there, Penn mostly reverted to its losing ways until the early 1980s when the titles returned and more goalposts came down. As the decades have passed by, less Penn alums probably know the story of that 1959 team. But thanks to the craftiness of one alum, maybe some will get to at least learn a piece of it … make that a few pieces.